In my previous post I talked about how to create model for localized values. Now it’s time to show how I’m querying against that model. I display language selection to the user. So all localizable data is preferably shown in the language the user chose. When displaying persons list, for example, person name is shown in the language the user chose or the first available localized value if the localization for chosen language was not found. I’ll use HQL queries for that, which return a projection from entity to DTO to contain only data I need. HQL allows better (and easier) optimization than using criteria and it’s easier to write. I also fetch the language id for localized values because I want to show to the user if returned value was in language he requested. When an object has many localizable properties then such a query could become too complex, too many joins. In that case it may be better to use different strategy for fetching objects. 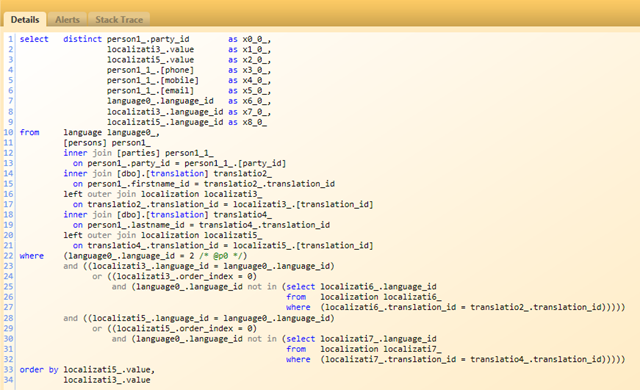 We can use NHibernate’s multi queries or Futures. I’ll show you similar example, but in a bit different context. In some situations it would be better to show to user all translations for selected language in a single list. For example when there is a language specialist to translate all values from one language to another. In that case we need to load all translations (for specified context, eg. person names) with localizations. In this case I need also to use paging to limit the result set. I use multi queries approach here. First I fetch translations for the selected context and languages list. 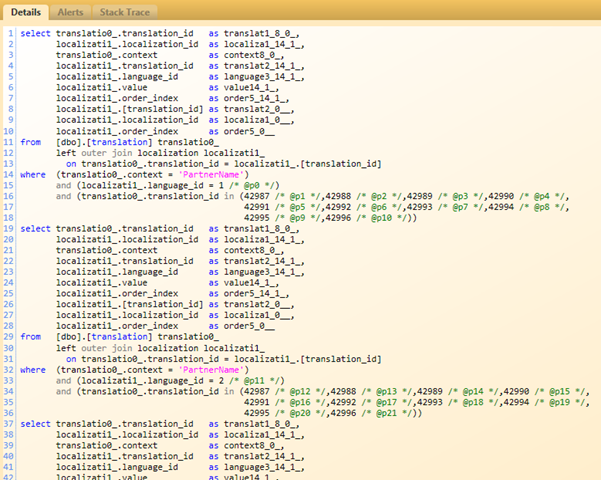 And for each language I load localizations for translations in separate queries. So I make total of two roundtrips to the database. The third query is similar to the first two, only for different language. I’m using only the first result set from the second batch. Other queries are only for fetching all available localizations for translations and actual results they return, will be discarded. That way I pre-load all the values and therefore there is no need for lazy loading them which in turn would result in executing multiple queries to the database. As I mentioned, the last approach may also be used when loading DTO’s, only in that case mapping to DTO should be done by the user (or use AutoMapper in some extent). Some time ago I wrote about translations. Now was the time to actually implement that feature. Because I don’t have any default language which is always present on an object, I had somehow create it virtually, so in case of translation is not found in current language, the default one (for a given object) will be used. I decided that the first language for an object (that is, the language in which the object was created), is used as a default one. So my data model looks like this. 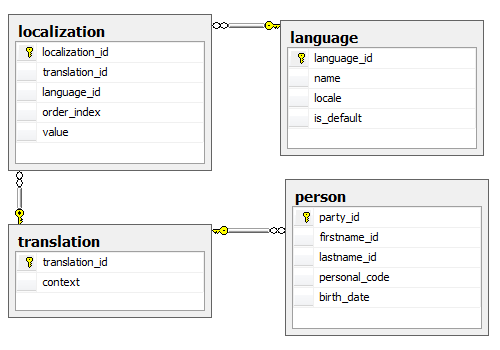 Firstname_id and lastname_id both refer to the translation table as foreign key relations. 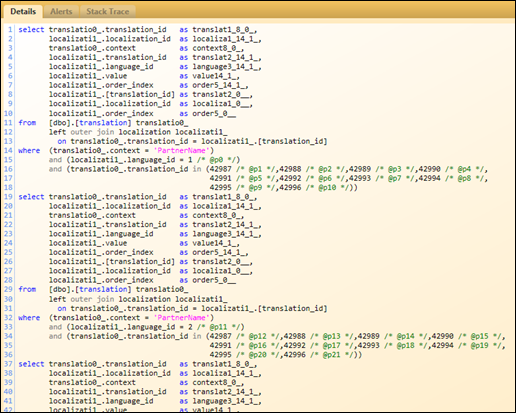 As you can see, I added indexer property to Translation to manipulate with localizations conveniently. Although I’m not sure if using an object as an indexer has any drawbacks later on… Thoughts welcome. You may have also noticed abstract Context property on Translation. It isn’t strictly required, but I found it useful in my implementation. By using this I can conveniently ask all the translations for person name or for product name, for example. This is useful when users need to translate all product names in a batch, so I can display them on a single form. 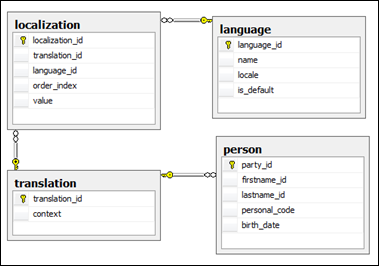 <many-to-one name="FirstName" column="firstname_id" class="Translation" fetch="join"
<many-to-one name="LastName" column="lastname_id" class="Translation" fetch="join"
There are not so many business applications which need multilingual content. I exclude any kind of CMS’s, they aren’t “true” business application anyway, in my opinion. But the current project I’m working on has that kind of requirement – most of the data must be available in multiple languages and users should easily and intuitively browse and edit that data in current working language. Part of this requirement is not so easy to achieve. Especially when there is a constraint that there cannot be a default language in it’s standard term – object may be available in any language and even only in that language. Currently we are using a single translations table where translation is identified by it’s context which is mostly some sort of object/field key or basically can be any string. All the translatable fields are stored in the entity table also as a “original value”. This solution is far from perfect and do not fit very well into domain model in general. It was meant to be a quick draft of the solution. Usually, this kind of translation should be invisible in domain model perspective. But in my case I think it should be reflected in domain model also, because it IS one of the purpose and requirement of the business application. There are two possible viewpoints to consider – a technical perspective and a user’s point of view. I’ve explored different models that people have used before and I think that the solution that Davy Brion describes seems the best one. It is tied to the domain object. That means there are direct relation between entity and it’s translations. It simplifies CRUD operations on it, NHibernate can take care of it itself. Searching from localized versions are also quite simple, performance overhead is minimal. It uses a single translations table. Actually there are couple of tables, but all translations are stored and accessed from one place. This makes later maintenance simpler and don’t create so much noise in the domain model (and in data model also). It’s quite simple to extend and it fits perfectly into NHibernate. 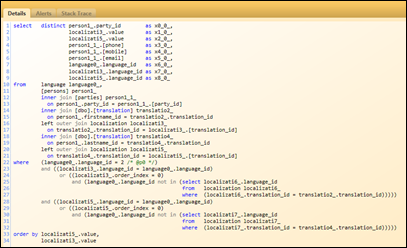 I find that for my solution I should also apply the default language attribute on the translation, because for different object, the term default language can mean different language from what is global default languages, if such exists. When using this model, every translatable property (a product’s name for example) is an object which holds at least one localization. We don’t have a term original like I have seen in some models, every value is a localization. This makes things simpler in users point of view. I don’t write about any technical data, you can check that on Davy’s blog, but I will update this blog post when I do any changes to this model. And I’ll try to provide some samples then.